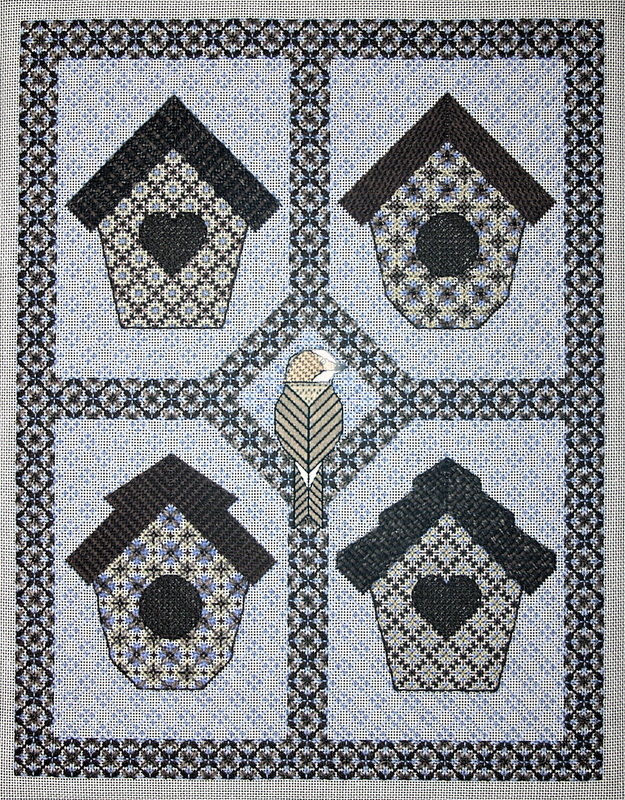 This charming four-patch design is a good learning piece for the intermediate level canvas embroiderer. Most of the stitch treatments are composite patterns with multiple steps, and some novelty threads are used as couched layers and other accents. All of the shapes are charted completely with the exact compensation needed. The border pattern is an open network of four-way clusters of a fun stitch unit that I call Hot Wheels because of its resemblance to the miniature cars. Many other patterns in the design are open, and the sequences are manipulated to automatically conceal the traveling paths. Any pastel ground will work with the browns in this design - consider pink and ivory as well as the blue and sage options listed below. NOTE: The model is done on a blue canvas so the instructions are written in this color combination. An alternative ground of sage is suggested so the thread substitutions needed are listed in parentheses to the right of the blue threads. If a different ground is used, just substitute the matching pearl cotton in the two values listed. Stretcher frame: 16" x 20"